Read the Resolutions, Reports & Minutes of the June 21 Ordinary Meeting, click here. This is been an exciting, innovative and to be honest- quite nerve-wracking experience. We decided to take a risk and to give ourselves a tough goal: to decontaminate an area, provide a community outcome and enhance the environmental values within the old South Byron STP site, without selling the land and by working alongside a private group or consortium. We are well on our way to realising this vision and creating this reality. There are a few great proposals submitted and we will now explore these more thoroughly and bring them forward to the community for feedback. Proposals going to the next stage include establishing a school, a wellness centre, aged-care and affordable housing. This area has never been open and available for the community, and currently we can only enjoy its view from outside a fence; soon we should finally gain access to the site. It would be irresponsible for council to spend around $2 million to decontaminate an area and then only open it up as open space with an ongoing cost to maintain, especially when we have an opportunity to decontaminate it without rate payers money and to get community benefits and environmental benefits. Also, the money we save or generate can then be used instead on better stormwater infrastructure or wider catchment rehabilitation to make Byron will more flood resistant and environmentally rich. Pleasingly, those behind proposals to establish an environmental centre on the site will be engaged to see if this great outcome could occur on a better site, with both greater environmental qualities and without decontamination- these conditions currently exist at the Valances road STP and West Byron STP. Well, we are now seriously on our way to delivering large solar projects within the Shire. This will be the first of many solar projects that will be even larger, more community-owned and realise even greater emission reduction outcomes. Oh, and this 100KW of ground mounted solar in the public carpark behind Council’s admin building in Mullum will also provide shade for cars and be a visible testament to the intent and values of both council and our community. Council is making great progress to realise a large-scale bioenergy facility at one of its sewage treatment plants (STP’s). Originally envisaged for the Brunswick Valley STP Valances Road, it has been shown to be more effective and appropriate to be held at the West Byron STP. It gives us the opportunity to deal with our organic waste, including grease, fats and oils from across the Shire to turn it into a renewable energy source. It is a particularly innovative and exciting project and now that we have shortlisted a group of firms who can bring this to life we will provide funds for a more thorough feasibility study. It was great for Council to be able to support some fantastic local community initiatives. Many groups don’t require a lot, but when funding is scarce it is very difficult to make great things happen. Now, with our support of $5000, Council has a chance to watch these groups projects become terrific realities. The three groups are: Byron Youth Theatre, Shedding and Sprung Integrated Dance Theatre. These groups are focused on those in our community who are often neglected, our youth, those feeling isolated and our physically and intellectually challenged. Being willing to say no to inappropriately scaled developments paid off for council recently when we reached a compromise and achieved a positive outcome in lessening the impact of a proposed development of three dwellings within the Heritage area in Byron Bay. Now, instead, there is to be a more appropriate two dwellings on the site. Legal proceedings are never a great reality, but sometimes they are necessary when we need to defend our planning rules in court on behalf of the community. When we do, we usually win and usually we achieve a better outcome, and we are soon to do so in this case. Living in an rural area myself, I know only too well the complexities within the issue of the growing number of events and weddings in our rural areas. It is too simplistic to just say no, shut the door and wish away what is currently and increasingly occurring, no matter what we think about the activity. Likewise, it is irresponsible to just accept what is happening, open the door and let whatever is happening to continue and grow. We are seeking to strictly guard this door and seek to put conditions in place to see whether any venue and location can hold events without impacting either neighbours or the rural environment, for example, one proposed condition for a 500 metre buffer between dwellings would alone ensure around 90% of currently used properties would not be allowed. However, the proposal still looks to leave it open for those who can prove they can operate acceptably to be able to do so. This is a similar issue to holiday letting whereby just saying yes or no can’t manage the realities facing us- and where trying to manage the reality and steer it in a direction that makes it as bearable as possible is hard but preferable. If the State government is open to our proposal, we will again seek more feedback from the community. The Uluru Statement from the Heart is one of the most powerful and moving pieces of writing created in Australia for many decades and it was hard to keep my emotions in check when reading it aloud in the chamber. It achieves the almost miraculous- combining the views and hopes of activists both indigenous and non-indigenous with the wisdom and support of indigenous elders. Created by over 250 elders and indigenous representatives from around the country, including Michael Mansell, Pat Dodson and the granddaughter of Vincent Lingiari, I was honoured to bring this notice of motion to support both the words and the intent. Though some indigenous activists don’t support this as they don’t support indigenous rights being enshrined within the Constitution, instead preferring a stand alone government, the overwhelming support from organisations and individual Australians who want to honour, value and walk alongside our indigenous mob is clear. This is a breathtakingly important document that needs the support and implementation from our community, council and nation. Well, after a decade of near misses and stalled take offs we are finally close to having a Coastal Zone Management Plan (CZMP) within Byron Bay- covering the area from the Main Beach car park to Cape Byron. When gazetted by the State Government, it will enable us, as a community, to look into the future with confidence and to be able to protect our coastal areas, our town, and find a way to create more beautiful and functional spaces along the strip that connects our town to our beach. Hopefully the gazette will occur shortly, so then we can work alongside the community to design how we want this area to look and function. When it was announced at an all staff function a few days ago that Mark Arnold would be the new General Manager, staff erupted in applause and cheering. He is the quiet guy who gets things done respectfully, clearly and successfully. I and the other councillors can’t wait to work alongside Mark to keep trying our best to get great outcomes for the community- welcome aboard Mark. The Northern Rivers has an opportunity to turn the concept of ‘waste’ on it’s head and instead consider it a resource. New industries, new economic development and better environmental stewardship come with new ways to deal with what we discard. With the advent of the Chinese refusing to be our dumping ground, we now have an opportunity to deal with our waste and to turn it into functional and usable products. This will lead to generating new, smart jobs, and generating resilience within our community. Byron joins Tweed with the intent of zero landfill and zero waste and now the wider Northern Rivers councils will soon also get on board to see how we might make this happen. Recently, I was lucky enough to find myself in a circle with some inspiring and extraordinary change makers from both Australia and the US. We were brought together to share ways we could see how our society could make the transition to the next economy-one based on fairness, empathy and sustainability. One person from Oakland, California outlined that to make any transition and to best manage the changes currently facing us, we needed to honour and invoke the 4 R’s- the Resistors, Reformers, Re-creators and Re-imaginers. Each played a role, and each needed to be active. The Resistor seeks to fight against the change we don’t want; the Reformer seeks to work within the current system to change it; the Re-imaginers seek to conceive of new systems that can serve us, and; the Re-creators seek to build new systems and new ways to replace the current one. Each has its role, but importantly, none must dominate too much. When asked in the circle how this fits within and can be seen within the Byron context, I outlined that in our case, we do the easier two: Resist and Reimagine incredibly well, but are in need of more support for the harder: Reform and Recreate. Resisting against what we don’t want is a time honoured tradition in the Shire and has ensured we have maintained an integrity and wholeness that other places long for. We should always honour our resistance successes. However, outlining the problem does not and cannot actually create anything or provide a solution. Likewise, here in Byron we love reimagining our future, and we all know of the wonderful conversations we’ve shared about how society could and should be. However, this too, does not and cannot actually make anything or get us to where we need to go. The two ‘doing’ aspects-reform and recreate-actually take us from thought and idea, into action and change. For me, what our community could benefit from is more microphones in front of reformers and recreators, and more space and support given to these two aspects of transition. If our community focuses on solutions and actions, we have the reformers and re-creators to take us on the journey. They can be aided by resistors highlighting and alerting us to the unwanted pitfalls, with our party shone bright by the re-imaginers. Then, we can truely be that exemplar community who can show others how to manage change and to transition to a sustainable society. We all generally have one or two dominant R’s and exercise these as default responses when faced with responding to changes in our own lives, and so too, does our community. Our challenge as individuals and as a community, is to balance all 4R’s, and while acknowledging our challenges, set ourselves the task to create our solutions. Like the guy in the pic-I usually try and make sure my placard waving and angry protest days stay in my past, but ‘geez’, the State Government’s recent acceptance and provision for the investment model that takes a house that is a home for locals and transforms it into an investment house used by visitors stirs plenty of emotions. There was nothing especially unexpected in the government’s moves, and now, we need to push for solutions and to try to do whatever we can within the ground rules set to minimise the growth of holidays lets and to free up houses to once again, become homes. I have already written to the Minister, seeking a meeting and we will still look for big picture opportunities to push back, but we will also focus on small wins that may have big effects, like in the fees we may charge, DA conditions enforced and other measures. Stay tuned as we roll these out. Car sharing should soon be coming to Byron. At the moment, Council has an Expression of Interest (EOI) process underway for car share companies to start a pilot program here. Car sharing can be a great option for people who need a car (or a second or third car) on occasions, just a few times a week or sporadically. For every car share vehicle used, 10 vehicles are taken off the road, assisting Council in it’s aim to reduce emissions. Oh, and in keeping with my initial spiel- it is an example of working on solutions as we transition towards a sustainable traffic, emissions and transport future. A skatepark in Byron Bay is in our sights-and we are rolling towards what looks to become an amazing space. Within the Sandhills area surrounded by the library and YAC, it is envisaged to be part of a wider community focus area. Our vision includes the construction of an all abilities, regional-size skatepark. The precinct will also include a playground with equipment for all abilities, wetlands boardwalk, BBQs, toilets and picnic areas. Imagine, walking from the Rec grounds, on a new board walk and via a wetland pond, and arriving at an amazing park to skate and hang. We are always looking for more help to bring it to life-get in touch and join the action team. It’s not too late to make a submission or take our survey here. Soon, Council will going underground. We will be installing underground irrigation across Apex, Dening and Railway Parks and Byron Rec Grounds and the Cav. The 5 schemes will use approx. 465,660 litres of recycled water each day! An additional benefit for the parks is that this will remove the need for manual watering- keeping the turf nice and loved even in peak and dry periods. This equals less costs for labour and materials and no more fencing off areas for re-turfing. Some of the best environmental outcomes can’t be seen-but our feet will feel them! Best River Win in 100 years? We recently secured a grant to match our funds to open up 7km of upstream habitat and allow 27.4km of fish passage. This will benefit native fish species including the iconic Australian Bass, which live in the upper freshwater reaches of the river and migrate to the lower Brunswick Estuary for breeding. Currently, they can only migrate to the upper reaches of the Brunswick River for around ten days every year when high rainfall drowns out the crossings allowing fish to swim up and over them. These grants will ensure that native fish will have access to 90 per cent of the river for 100 per cent of the year- a biodiversity bonanza for the Brunswick River. It is one of the proudest achievements I have been a part of in my 10 years on Council. Remember when, in my last edition, I outlined that some staff and I made a last minute dash down to Sydney to get in front of the Roads Minister and Transport NSW boffins to ensure the bus interchange goes where we want it? Well, not only did we get a commitment they would locate it out of the rail corridor and near the water tower whilst protecting the tower itself , we’ve seen the designs that achieve it. This time lapse video shows the creation of a new bridge to replace the old Durrumbul Road causeway over three months and including a period of heavy rain. Click on this video, and you will join nearly 7000 others who have watched this really short and cool inside look at how bridges are made. Hard hats not required when watching. Each edition of the bulletin provides a test for even the most old school of locals. Big Up’s to those who guess correctly! Each edition of the bulletin will test even the most observant. Big Up’s to those who guess where this pic was taken! Scroll to the bottom for the answer…. Council is working on the North Byron Shire Floodplain Risk Management Study and Plan. If you live in the northern part of the Byron Shire and have seen floods over the years, please share your on the ground knowledge and complete a survey that will provide important local flood information and/or your thoughts on various mitigation options. Have your say on Council’s proposal to transform the existing, under-utilised Sandhills Estate in Byron Bay into a revitalised space for community connection and recreation. Council’s vision is for the space to become a multi-generational precinct featuring a skatepark, playground with equipment for all abilities, wetlands boardwalk, BBQs, toilets and picnic areas. Wow all know and love Santos for its organic produce and products, well, now there’s even more to love-the Santos Organics Staff Charity Fund. The team are given the option to donate 1% of their wage to the fund which Santos Organics matches dollar-for-dollar. At the end of the fundraising period, those of the team who donate to the fund vote on who should be the recipient of these funds. Just recently, over $40,000 was donated to: Byron Youth Theatre, Byron Hinterland Seed Savers, Byron Bay Homeless Alliance, Future Feeders, Australian Rainforest Foundation and Plastic Free Byron. Santos is now a fully registered not-for-profit organisation with a purpose to enhance the natural environment. Byron Bird Buddies (BBB) is a green jewel of the shire. Involved with avifauna monitoring, conservation and education in the Northern Rivers since 2004, Byron Bird Buddies conducts a number of monthly monitoring and education activities with the aim of improving the conservation and knowledge of birds within our Shire. BBB members conduct regular shorebird counts at five different locations guided by the Birdlife Shorebird 2020 project. The locations are: Belongil Estuary, Byron Wetlands, the north side of the Brunswick River known as Marshalls Creek, the southside of the river known as the Saltmarsh and at Vallances Road. A calendar of events for the next six months can be found if you click on the image above. When choosing a way forward on the Brunswick Heads holiday parks issue, we’re faced with a tough choice: dig our heels in, possibly prove ourselves legally right and then likely be left with less than what is currently possible. Or, we can drop the need to be right and get more foreshore access, better ramps, and future wins. Welcome to Councillor’s juggling act! With getting the best outcome for the community front and centre, most of us will soon choose the option that gives us more. We are negotiating to get at least 3 times wider public access along the foreshore of each park, better and upgraded boat ramps, a carpark and kids playground for the public and the protection of the memorial cypress trees. We will not satisfy our desire to rally against and halt the state government’s continued land grabs along our coastal areas. Hopefully our state representatives can help us with this. For me, and for the rest of those supporting resolving this issue, we are locals, working on a local problem, searching and soon to gain local benefits. So, what will we gain? We all want public access along the foreshore and we want it unfettered of tent pegs, sprawling campsites and from feeling we are encroaching on visitors’ set ups. Instead of the required 3 metre setbacks, we will achieve 10 metre setbacks, and in some areas, around 15 metre set backs- 3 to 5 times more than required. This will allow for koala tree planting and a better chance to re-establish a koala corridor. We will also gain a large public space along this foreshore that will allow for playing, hanging out and meeting friends. This too, is not required, but gained due to courageous negotiations. We want a decent, upgraded public boat launching ramp that has decent parking and doesn’t make the public enter the park and request permission to use it. We will gain this. We will get an upgraded ramp, with plenty of parking and separation from the park. So- when considering the two main community demands for the Ferry-unfettered public access along the foreshore and a decent, restored and formal boat ramp- we will achieve these. Like Ferry, we want public access along the foreshore and again, we want it unfettered of tent pegs, sprawling campsites and from feeling we are encroaching on visitors set ups. Instead of the required 3 metre setbacks, we will achieve 10 metre setbacks. We want Lot 7005 to be for public use. We will achieve this in part, but the gains are better than hoped. Though we won’t get all of this disputed lot for public use, (traditionally used for informal car parking at peak times), we will get a section of it, and in this section, NCHP will create a formal carpark and children playground-both for the public. Thus, though we wont own it, NCHP will provide public uses that saves Council having to pay for and will provide a great public benefit. On balance, I believe this is a reasonable outcome. We will also gain other benefits: a small craft launching ramp will be upgraded and car parking for public use provided. The boat craft that used to block access to the river will be formalised to one side, opening up the Massey Beach once more. Also, the area along the old Tweed st area, next to the Mexican restaurant will finally go back to become a public thoroughfare, landscaped, free of cars and leading directly to the river. So- when considering the three main community demands for Massey Greene-unfettered public access along the foreshore, a decent, restored and formal boat ramp and public use of Lot 7005- we will achieve most of these. Like Ferry and Massey Greene, we want public access along the foreshore. And we want it unfettered of permanent residents encroachment and from feeling we are encroaching on visitors’ set ups by having to walk through a camp ground to access town or Simpsons creek. We also want the Cypress Pines, planted as memorials to our fallen Brunswick Heads pioneer young men who fell in WW1. Here, we have some more work to do, but are very close to gaining what we want. We will most likely achieve the 10 metre set back, either along the whole stretch, or the vast majority of it. We will ensure an ecologist report pre-empts any decision as to how best protect the pines, and are hopeful that the proposed 5 protective zone around each cypress pine will help make this happen. We will ensure that more conversations occur between adjacent neighbours, permanent residents, council and NCHP, and an ecologist who will work towards the best way to ensure the sustainability of permanents, and the pines. We can also achieve 10 metre setback- instead of the required 3 metre setbacks. And finally, being brave enough to negotiate in good faith within the unfair rules of the game before us can gain us all the benefits in Torakina, the Soundshell area, erosion management and creek management and the stretch all the way to the Bowling club, as all these areas are managed by NCHP. Already our ability and courage to negotiate has resulted in the proposed carpark and resultant tree loss at Torakina scrapped. It has also resulted in the proposed and highly unpopular boardwalk new the kids playground scrapped. The new motion before us moves us closer to a great outcome for the community- including affected neighbours and permanent residents. Moving forward does not mean we forget or underplay both the struggles endured and injustice suffered. We have been dudded by successive state governments. Both Labor and the Libs/Nats have systematically, deliberately and ruthlessly taken ownership of these areas from council and we have been scrambling to be heard ever since. I thank all the community members who have fought this fight, for the only reason we are now set to gain more than we would have normally is because we demanded a decent deal solidly and consistently. However, we won’t get everything we deserve. We won’t get our parks back into council hands, we won’t get the old time camping holiday park style back and we won’t ever get acknowledgement of the injustice we suffered. This is a legacy issue not created by this council, or even the last two councils, but this council finally has the opportunity to get more for the community than is required to be given by the parks operators. This council can establish an ongoing relationship with the operators to bring benefits for not just the parks, but all the river and creek side areas along Brunswick Heads. The Byron Bay pay parking scheme is set to be introduced at a revised $3 per hour and the annual residents’ exemption set at $50 per year. Centrelink blue cardholders would not incur a fee for the pay parking exemption. Those who work in town but live outside of Byron Shire, will also be able to apply for a $100 yearly exemption and park on-street and in Council managed car parks. As an incentive to park outside of the town centre, additional parking will be created in Butler Street Reserve. Clarkes Beach car park, Jonson Street (south of Kingsley Street) and on-street east of Middleton Street will also be capped at $20 for all day car parking or $10 for 4 hours. Council will also continue to explore how the markets can co-exist with a pay parking scheme in place or identify at least equally appropriate sites within the town centre. The pay parking scheme would apply between 9am to 6pm on-street in Byron Bay town centre and from 6am to 6pm in Butler Street Reserve. Mayor Simon Richardson said in listening to public concerns, the revised pay parking scheme has been about finding a balance, knowing that it is impossible to know all the answers of such a scheme before we start and thus, changes and adjustments can and will be made as the reality unfolds. “It’s been a moving conversation with many different groups over the past twelve months. But one that was necessary to arrive at a scheme that is equitable, aims to change parking behaviour and create a new revenue scheme for Council. “A $50 exemption, a rise of $25, is pleasingly less than the recent $100 proposal and will allow locals to park about town as per normal, with some additional all day car parks provided,” he said. Mayor Richardson went on to explain that doing nothing was not appropriate or possible. “With little state government funding support available for Council to cater for the nearly one million day visitors, we have to raise revenue ourselves. “Traffic is getting worse and we need to fix our ageing infrastructure throughout the shire. “Along with reviewing property assets, procurement and becoming more efficient, pay parking is an integral part of our Fit for the Future plan. “Council needs to look for ways to generate revenue or face the possibility of amalgamation or significant ongoing rate rises for ratepayers. “Whilst our landscape footprint is that of a small sleepy coastal town, the 1.5 million visitors who arrive each year tell a different story. “It is only fair that we ask for a contribution from our visitors for the privilege of using the facilities within our beautiful area. “Not fixing our traffic, parking and infrastructure will be risky for business and turn people away from visiting Byron,” he said. Mayor Richardson again highlighted that the revised pay parking scheme had significant incentives for visitors to park outside of the town centre. “Consultation from the Byron Bay Town Centre Masterplan has shown that locals want a pedestrian friendly town centre and pay parking will help provide the motivation to park at a discounted rate on the outskirts. It will begin the process of making the town better for people to enjoy,” he said. A parking permit for residents who live within the perimeter of the pay parking area would be issued and allow them to park on their street as per usual. Mayor Richardson said the pay parking scheme will also consider businesses with multiple vehicles. “The technology that supports the pay parking machine will allow for the scheme to be adjusted. “How we pay and the option of payment instalments will also be confirmed following the tender on parking machines. “Staff will also ensure that impacts to the local primary schools in the town centre for teachers and parents will be minimised,” he said. No. 1 Matter of Urgency – Dredging works in the Brunswick River Resolved that Council writes to the Minister of Lands and Water, the Hon Niall Blair, seeking a deferment of any dredging works in the Brunswick river until the following questions have been considered and answers provided and that permission to use Council’s boat ramp to launch the dredge vessel will not be granted until support has been gained through Council resolution. As works haven’t occurred for over 20 years, is work proposed ‘maintenance’ or new? If considered maintenance, what ongoing maintenance is proposed? What are estimated ongoing costs to maintain the assumed benefits? Has the stated purpose to “enable safe boat passage” and “address public safety and environmental risks associated with shallow depths causing vessels to run aground” been assessed and supported by evidence? What are the specific measurable triggers that are being applied? Are there documented reports of any accidents and/or injury as a result of shallow waters? Has there been any effort to implement signage in the river indicating the deep channel areas and speed limits? Is the area concerned currently un-navigable? Is there evidence of this? Did the REF consider cumulative impacts of ongoing or recurrent dredging? What modelling has been used to consider the rate of natural sand replacement, and at what regularity is proposed for the ongoing maintenance. What documentation exists to support the selection of the three proposed dredging sites? Have immediate and ongoing impacts on sea grasses been considered? Are there any potential nearby geomorphic disturbances identified, such as heightened erosion or accretion? What are the specific measurable triggers that are being applied to effects of works, natural sand replacement processes and environmental disruptions? Has a cost-benefit analysis been completed that incorporates environmental and social considerations? What commercial fishing benefits have been identified and what evidence has been produced for justification? What evidence exists to illustrate any current navigation impediments to commercial fishers due to the current state of the river? Have impacts of dredging for recreational fisherman been assessed? What assessment has been conducted, and evidence provided, to verify the claimed benefits for local economies and tourism industries? Does this assessment include possible negative impacts due to ecological and marine disturbance? Does OEH support the work and agree with the necessity? Does Marine Parks support the work and agree with the necessity? Does Marine Parks have concerns and have these concerns been investigated? What are the strategies being put in place to overcome articulated areas of concerns? Has the local Tourism organisation been consulted? Do they agree with the stated need for the dredging? Has the REF been exhibited for public comment? Has community sentiment been assessed and considered supportive of the proposed works and the needs as stated of them? The motion was put to the vote and declared carried. Crs Cubis and Woods voted against the motion. While Australian governments are undermining the renewable-energy sector, there’s positive action from local not-for-profit groups and Byron Shire Council. And to facilitate a unified plan of reducing fossil-fuel emissions, not-for-profit research and education organisation Beyond Zero Emissions (BZE) held a workshop with mayor Simon Richardson at Cavanbah (the Byron Regional Sport and Cultural Complex) on Sunday. BZE CEO, Dr Stephen Bygrave, told The Echo the forum was aimed at creating plans which could reduce emissions across five sectors of the economy: energy, buildings, land use, transport and waste. The group of around 50 also discussed ways of encouraging high-end energy users to become sustainable. They include developers vying for new housing estates, energy providers and Rous Water, the local utility that provides several north coast councils with water. Emerging micro-grid technology was also explained, whereby small networks of houses/businesses that are producing excessive solar power can feed into the grid to another network which may be experiencing extended cloudy weather conditions. Siemens representative Warner Priest was also at the meeting, and told The Echo his company has a keen interest in micro-grid technology. The next step, Dr Bygrave says, is to establish working groups for the five sectors. ‘We will develop a common action plan template for each group, and a baseline of emissions will be established from each group, from each sector. Mayor Richardson was enthused by the chance of the five sectors becoming unified, which could lead to funding opportunities. I would suggest that a large area of the deforested areas if put under giant bamboo plantation would be a great renewable asset. Moso Bamboo grows up to 1 meter per day, a huge carbon sink that can be harvested for building, textiles, bio fuel & pulp and paper goods. It won’t even need to be grown in agricultural areas. An amazing opportunity exists to do this – and just as a bonus – consumes a vast quantity of C02, it’s plant food. 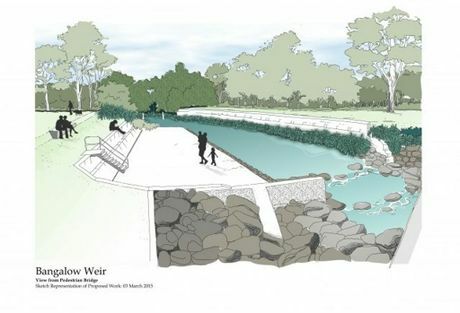 THE Bangalow Weir remediation is getting closer with the delivery of donated rocks, whilst design drawings and environmental approvals are finalised. Byron Shire Council’s infrastructure services director Phil Holloway said the latest concept drawing of the remediation works has also recently been completed. 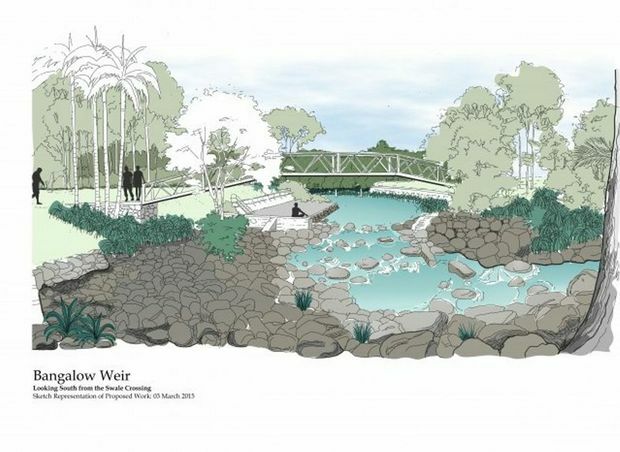 “In working with the community we are proposing to keep key elements of the Bangalow Weir such as old swimming platform, and use the rocks to reinforce the side walls and create rock pools that support fish habitat,” he said. Mayor Simon Richardson said the Bangalow Weir has strong heritage, social and environmental values and the local community is understandably very connected and passionate about the site. “It’s well recorded as being a focal point for Bangalow locals. It’s a place that many have swum, picnicked or even married,” Cr Richardson said. “The challenge has been how we maintain the cultural and environmental needs of the failing piece of infrastructure to ensure its longevity for many more years for the community to enjoy. Mayor Richardson also thanked Bangalow Parklands for their ongoing support and a local building project for the donated rocks. 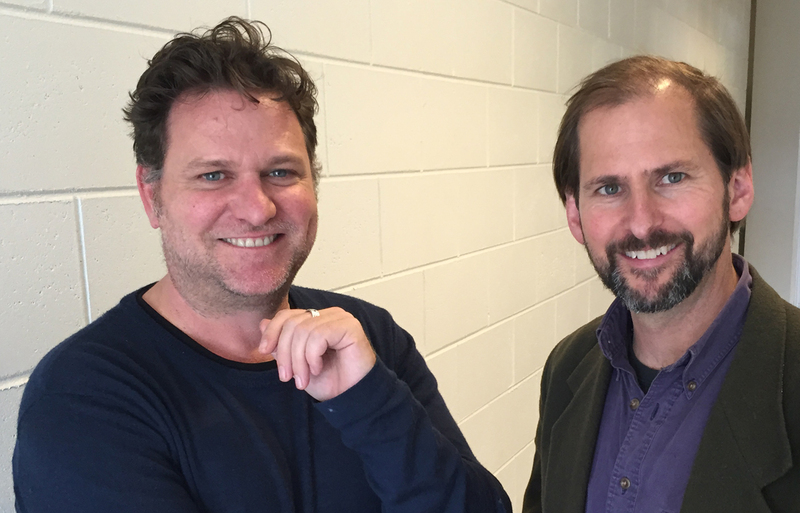 “Bangalow has a strong sense of community and it is very rewarding when Council is able to partner with a local group to deliver a positive community outcome,” he said. Landscape drawings of the proposed works will be on display at a Community Information session held by the Bangalow Parklands Team on Sunday March 22, 2.30-4pm, at All Souls Anglican Church Hall. The day is also the 90th anniversary of the opening of the Bangalow creek swimming pool. As well as sharing a giant birthday cake for the weir, the occasion will provide an opportunity for the Bangalow community to be updated on progress regarding repairs to the weir wall and the evolving plans for the bandstand. Plus, include a slide show of the weir through the ages, and there will be a display of the current Masterplan for the Parklands, including various elements which will emerge over time. Mr Holloway said once all approvals have been received, Council will source additional grant funding to supplement the $60,000 already allocated to the project. Byron will be a place where our natural environment continues to flourish and our shire is self-sustaining with global leading waste and water management and with our houses and businesses, towns and villages powered by cooperatively run renewable energy sources. It will be a place where people are the focus within towns and villages; where we can meet in informal and creative public spaces, surrounded by art and playful areas. A Shire where our development is well planned and well managed. Growth utilises the rail corridor, world’s best design and appropriate focus on maintaining our assets. It will be a place where the community continues to be active and brash, have integrity, vibrancy and a progressive commitment to caring for each other, our local environment and the planet. It is an inclusive and innovative community, inspired by group of leaders who are actively producing great initiatives and promoting our community with positive influence. It will be a community that is never afraid to say no to development that takes from us and always has the courage to yes to development that adds to us. It will be a place we are open to sharing our place with the world; where tourism adds to who we are, sitting beside globally significant creative, research, agricultural, innovation and education industries. A place where are our kids can stay and have meaningful and substantial careers or leave and share their expertise gained here with the world. It will be a place where the Council sets the example for all organisations and businesses, having, at its heart, a 4P bottom line: People, Planet, Purpose and then Profit. It will be a place where we move sustainability, utilising the rail corridor for park and ride and public transport uses and to connect our towns and villages. It will achieve all this due to financial sustainability, and a commitment to world’s best practice, risk taking, innovation, creativity. This vision of what we are creating in Byron is underpinned by a spirit filled with wonder, humility and respect for each other, our place and our world. The cost to establish a privately owned diesel rail shuttle service from Byron Bay’s Arts and Industry Estate into town has put the credibility of a $2m government-funded rail study into question. At around $300,000 per kilometre, the 3.4 km railway project planned by the North Byron Beach Resort will come in just under $1m, according to manager Jeremy Holmes. He told The Echo that only one in seven sleepers need replacing, along with repairs to the Belongil Creek bridge, platform construction and upgrades to level crossings at Kendall and Shirley Streets. And a 100-seater two-car currently being restored is, ‘Technically not light rail, but is regarded as lighter than normal rail,’ he said. Ongoing costs would be subsidised by a passenger fare in the order of $3 for a one-way journey, according to the resort’s website. So what does the 2013 government-funded Casino to Murwillumbah Transport Study say about railcar shuttle costings and viability? While no detailed analysis of light rail or rail shuttle was undertaken, consultants Arup claimed that the estimated construction cost to ‘reinstate rail line to a level suitable for XPT services’ from Mullumbimby to Byron Bay would be $202,326,700. Light rail and rail shuttle costings were not analysed, according to the report, because, ‘It has also been recognised that a rail commuter service (either light or heavy rail) would not be viable without a significant level of ongoing government subsidy’ [page 8]. Additionally the report concluded, ‘Light rail provides fewer transport benefits than heavy rail’ [page 67]. Overall, the Tweed Council report found it provides a ‘good rail service at frequencies that are relevant to customers’, despite the assets ‘being in poor condition’. The Echo asked MP Don Page (Nationals) if he was concerned with the lack of costing analysis for rail shuttle in the rail report, and whether it could result in skewing poor public transport outcomes. He replied that the section of rail between town and the North Byron Resort is in fairly good shape. ‘It’s much better than in other places including through the Tyagarah area, which is in very bad shape. ‘The costings in the transport study were only one factor which led to the conclusion that any combination of trains, regardless of cost, would not meet the public transport needs of the northern rivers region. ‘Rail not being able to serve two of the three largest populated centres (Ballina and Tweed) was a major reason trains were ruled out, as was likely patronage levels. And with the most recent government-funded rail trail study supporting the removal of the tracks, what is Byron Shire Council’s position? At the October 9, 2014 Council meeting, Cr Ibrahim put forward a contentious motion that saw Council writing to minister Don Page ‘fully supporting’ the Northern Rivers Rail Trail (NRRT) project, despite it being far from united; the vote was 5–4. Cr Ibrahim told The Echo the motion was about ‘securing regional investment’, referring to the promise of $75m from the government and the recent rail trail study. ‘I had it on good advice that the northern rivers was in a good position to secure a massive investment in regional tourism, the precise sort of tourism that our own strategy is aiming for. ‘I campaigned for the rail trail and many people I spoke to during the campaign told me that the rail trail was a no- brainer, and that trains would never come back for the simple reason that hardly anyone would catch them. ‘When thinking about the most important piece of infrastructure we have in the shire, isn’t it rational to do our due diligence and look at all the options, cost and design them, and then choose the best option? ‘I applaud the efforts of NRRT to turn a disused piece of infrastructure into something that may be used by ten per cent of residents and ten per cent of visitors. Ten per cent is better than zero per cent. But is that the best Byron can get?